Today we are launching a project we’ve been working hard on for several months: The Domain Deliverability Statistics tool. Using this tool you can see the domains we’ve delivered the most email too over the course of GMass’s life, and their open rates. You can search for any domain and see sends, open rates, and bounce rates across any time range. 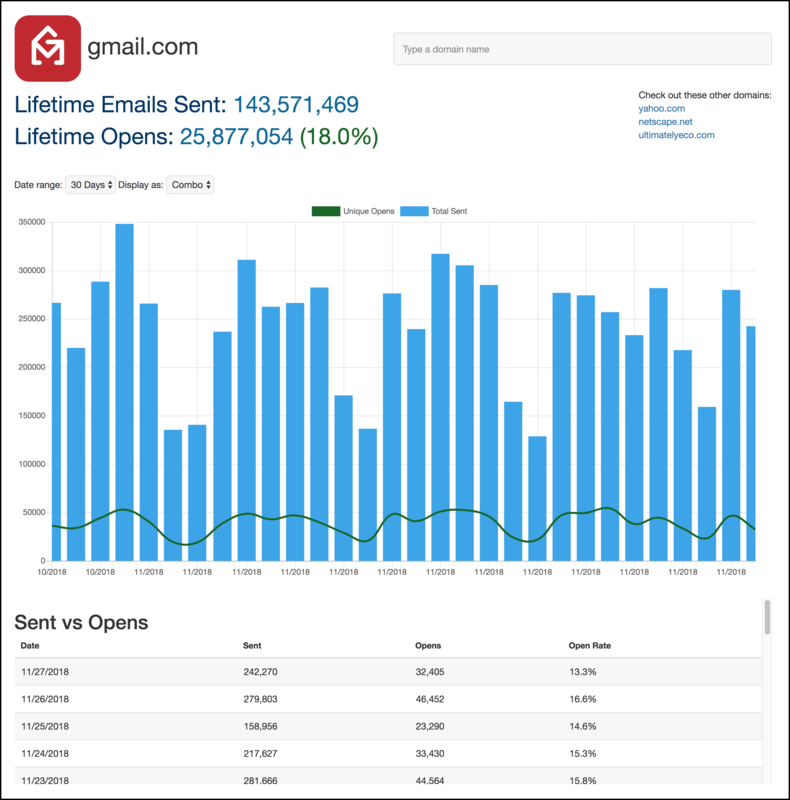 Want to know how well or how poorly we’re delivering to gmail.com? Just go to the gmail.com domain page. Still have some old-timers on your list using aol.com addresses? Make sure we’re delivering to aol.com. This is a free, public utility that is updated daily with new data. Just for the fun of it, let’s look at GMass’s lifetime delivery to gmail.com, as of today. gmail.com is the most popular email receiving domain in the world, so this chart shows not only our stellar open rates to gmail.com, but also the growth of GMass’s sending volume over time. In addition to send rates and open rates, the tool also shows SMTP bounce codes generated by the email server for each domain. Again, just for the fun of it, let’s examine the bounce code data for gmail.com. Now what this screenshot doesn’t show is that we actually organize bounce codes into two categories: Bounces and Blocks. Technically, “bounces” and “blocks” are the same thing, from an SMTP perspective. They are codes returned by the remote SMTP server indicating that the delivery of the email was unsuccessful. We took a human approach to separating out “bounces” and “blocks”, categorizing it as a true “bounce” if the email address is invalid and categorizing it as a true “block” if the remote server rejected an email for spamminess. If you were to look at the actual gmail.com delivery page, you’ll notice that the top reason for a block to gmail.com is the dreaded 69585 block code, which is expected, but necessitates an explanation. The 69585 code is returned by Google to a sender before the email reaches its destination. 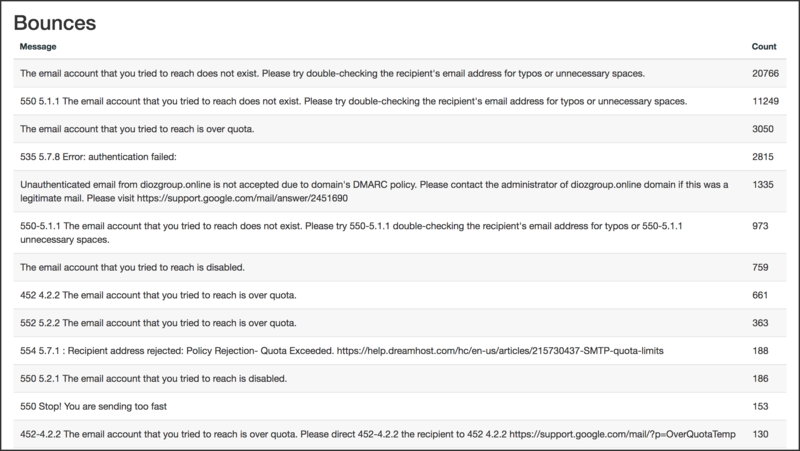 It indicates that Google has prevented the email from leaving its network and reaching its destination because Google has deemed it spammy even before the recipient’s server has deemed it spammy. This can also happen where both the sender and the receiver are within the G Suite email ecosystem.